So excited here at Amo Espaco to be featured in Grand Designs Magazine Online, showcasing glazing that transforms your renovation. 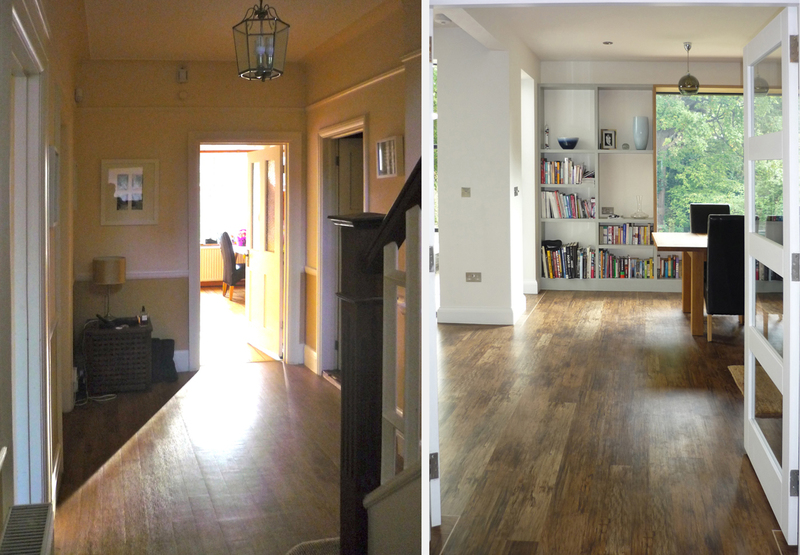 Take a closer look at this ground floor renovation, how to keep it personal, organised, light and mindful. Let there be light – open up your space to the outdoors and banish dull spaces. …include what you love and it will be home. The renovation was powered by the Amo Espaco mantra: make it personal and it will be mindful. Thanks to clients Olly and Ant for inviting me to help them realise their new ground floor space and for the fun we had along the way. Thanks to David at the Big Picture for lovely photos once again. Take a look at this coastal renovation talking shape in Salubrious Salcombe. I’ve just been checking on the progress of the refurb of a hillside coastal home in Salcombe with my lovely client. The house has a strong 70’s feel so we have embraced that with open arms to reinforce the mood and banished any thoughts of blue and white wooden lighthouses and “gone fishing” signs! Strong colours and bold pattern bring drama and warmth to this space, lighting nods to Hollywood Hills glamour reinforced by the lofty aspect of this house, with huge picture windows to the views of the hills. The kitchen splash back (above left) will transport you to 70’s domestic bliss but with all the comfort of today’s modern appliances. 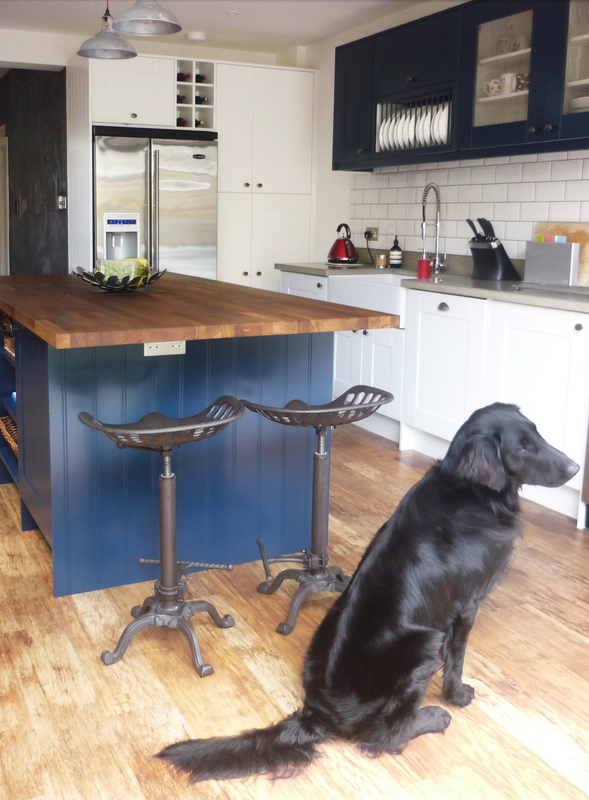 Amo Espaco has refurbished this client’s kitchen in London and in that process we have upcycled some of the old units and brought them to Salcombe to create a fantastic funky holiday kitchen by the sea, eco guilt-free. Trees are an inspiration for some of the art and materials featured, along with beautiful photography and some cool music fan touches. My client looks forward to making the most of her weekends here and will be inviting friends and colleagues to do the same, feeling all the benefits of a break away for mind and body. Can well planned storage be part of the answer? There’s a practical simplicity to “a place for everything and everything in its place” but there’s joy in making your home your own. 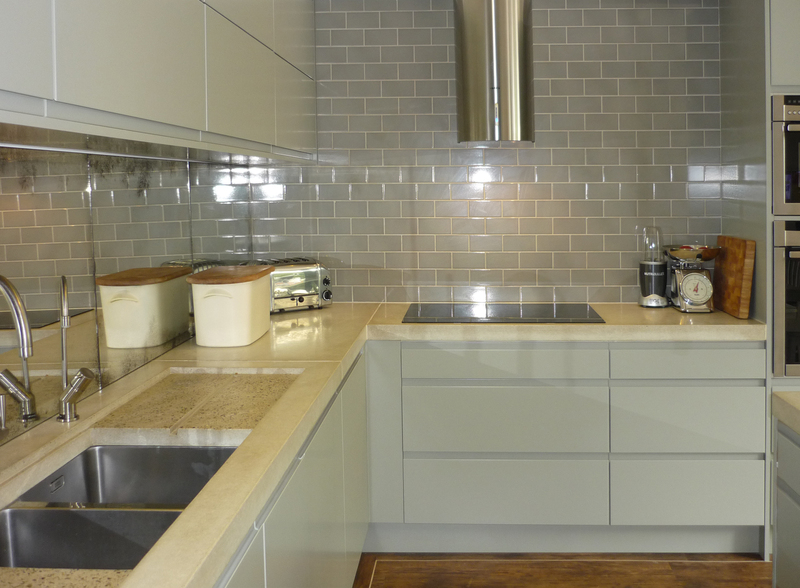 If your next project is a new kitchen then function and storage are top of the agenda. Islands are great devices for adding much needed storage while also absorbing other activities and serving as the command centre of the kitchen. If space allows, it can be practical but also satisfying to use areas dedicated to specific tasks like the beverage and bread surface below. What happens in the space you are looking to improve? Does the activity change depending on the time of year? Never miss an opportunity to include storage in any bespoke furniture you may be considering like in the space below. This space does many jobs – it is a lounge area with wood burning stove, it’s a place where the family reads, watches tv, practices music and it also gives access to the deck and garden. This space is the scene of many different kinds of activity requiring hard working furniture solutions to make it comfortable, functional and relaxing all in one, while remaining easy to keep tidy and maintain. Storage doesn’t just have to be about a place for all the working parts of your home. It should also provide the backdrop to telling the story of your family life; your vinyl collection close to the deck ready to enjoy at a moment’s notice, mementos of family travels alongside photos of the ones you love. This is what makes your house unique to you, packed with personality. Well planned storage can also address one of the higher stress moments of family life which is, of course, arriving and leaving the house. A place for everything ensures what you need is to hand in those rushed moments. Or if you’d prefer scenes of Michael McIntyre comedy gold then own your domestic chaos! But seriously, if a little forward planning for storage in your project results in a calm, organised, restful home like this one, then don’t fight it and make sure it’s something you give lots of thought to in the run up to your renovation. Amo Espaco mantra #2: functional can be personal, beautiful and mindful! Location photos by The Big Picture for Amo Espaco, additional photos of logs from Insteading.com and garden tools from The Wedding Shop.com, thank you. A new year and the urge to renew, refresh and make our homes mindful spaces – the ultimate renovation goal any time of year. Let there be light – open up your space to the outdoors and banish grey January. Declutter – bring some order to reveal your precious things. Discover your pared down space and find room to breathe. Hide away functional appliances and get organised. Remember the Amo Espaco mantra: make it personal and it will be mindful. Terraced house side return extension from amo espaco on Vimeo. Watch out for the video of this beautiful side return extension coming soon. Thank you to Amo Espaco’s lovely clients for allowing us to share it with you. 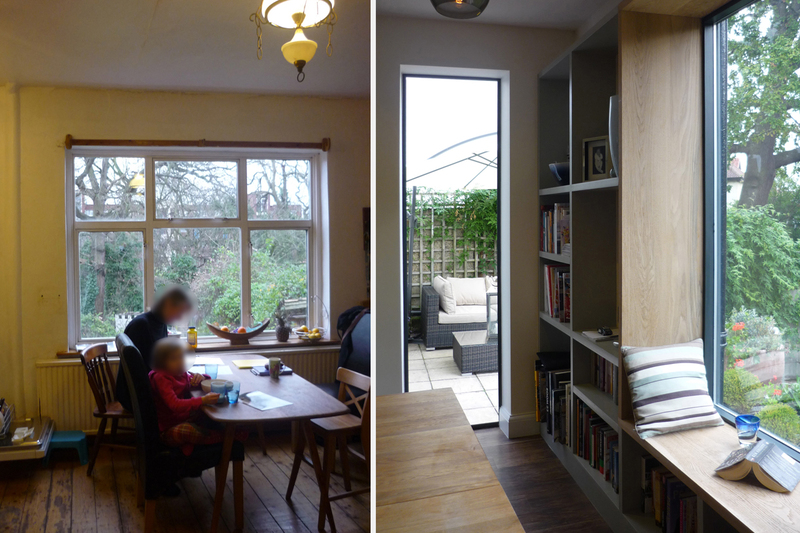 Here’s one renovation story made really enjoyable by lovely clients and a wonderful builder – this is what it looks like when all the key elements come together in the right way! You will see from the process menu above that the initial consultation between the client and amo espaco is getting to know them, thinking carefully about priorities, lifestyle and dreams and arriving at some tangible goals for the project. Then the fun starts – moodboarding and gathering inspiration. This renovation threw up several challenges around textures and materials. We spent time looking at how to resolve key spaces on the ground floor. Pinterest really came into its own for us, helping us collaborate and discuss remotely, saving time and keeping the creative momentum going. Sketching – it’s amazing! How else are you going to know what your new space will look like? 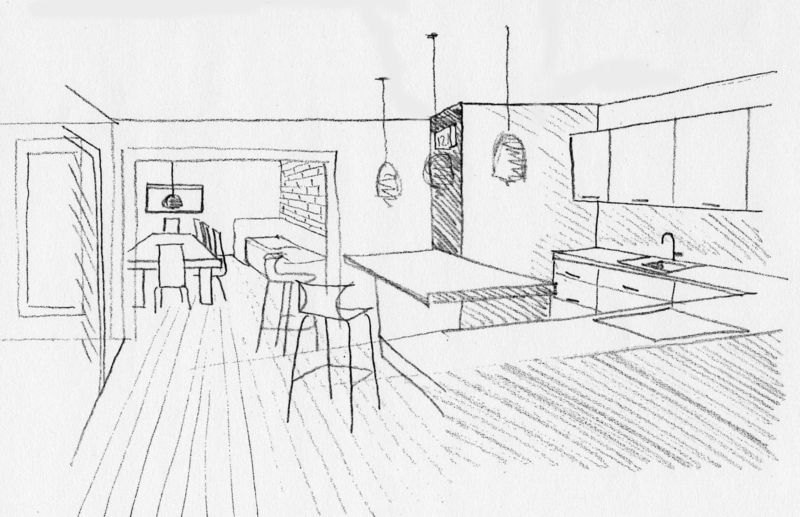 Often when clients come to me they are really struggling to visualise their current space working differently, so at this very early stage of idea generation, I can show them, to scale, with their furniture or new fittings, how their new space will look. This is what makes this creative idea-generation stage of the process so exciting. When the work is complete it is actually possible to hold up the initial sketch of the new space and see how it has come to life. Now, the bit you really want to see – the “before” and “after”! Here’s how we enter the new space, the old hallway transformed by new double doors streaming light into the main house from the enhanced glazing. 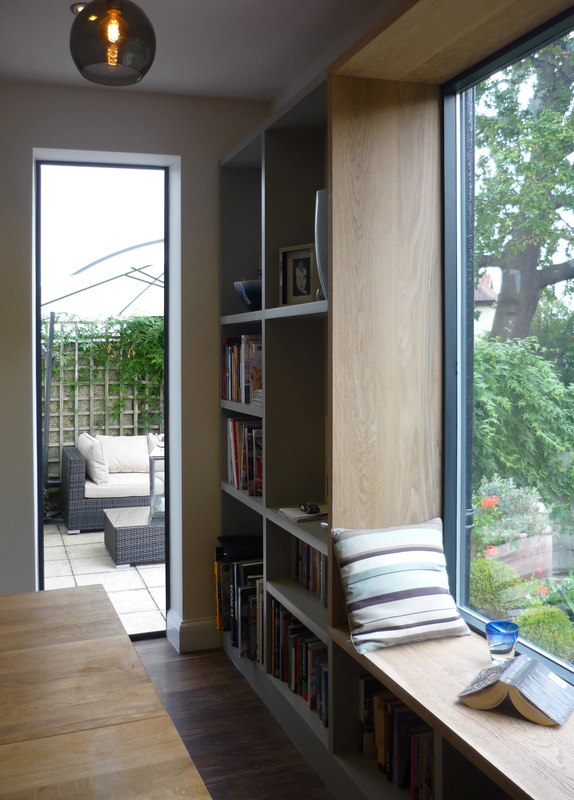 The rear of this property looks over the garden from a position of height – there are steps down to the lawn and the view of trees and greenery is lovely – the clients felt drawn to this window so we decided to make it a real feature. We enclosed the window and view in a deep frame in which you can sit, and this frame then allowed us to build in much needed storage – for toys, books, photos, music tech and all the trappings of domestic family life. The focal point – the beautiful view – delivered not only an enhanced experience of the space, but a functional one too! What is now the kitchen, dining and family space was in fact two good sized rooms. We have flipped their functions with the kitchen now in the old dining room and the dining and family space where the kitchen used to be, with a large opening between them. 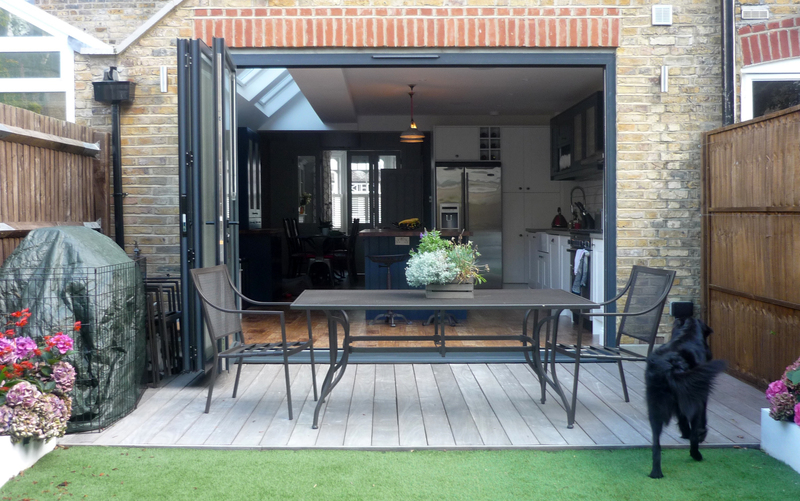 We’ve also, along with the new feature window seat, added Crittal doors to the kitchen and dining spaces, making the most of the beautiful garden and the interesting higher position these spaces hold, creating a lofty feel. The generous ground floor space allowed us to create a boot/utility room, where all the muddy rugby boots and running gear can be sorted out, keeping the kitchen for more pleasant tasks. 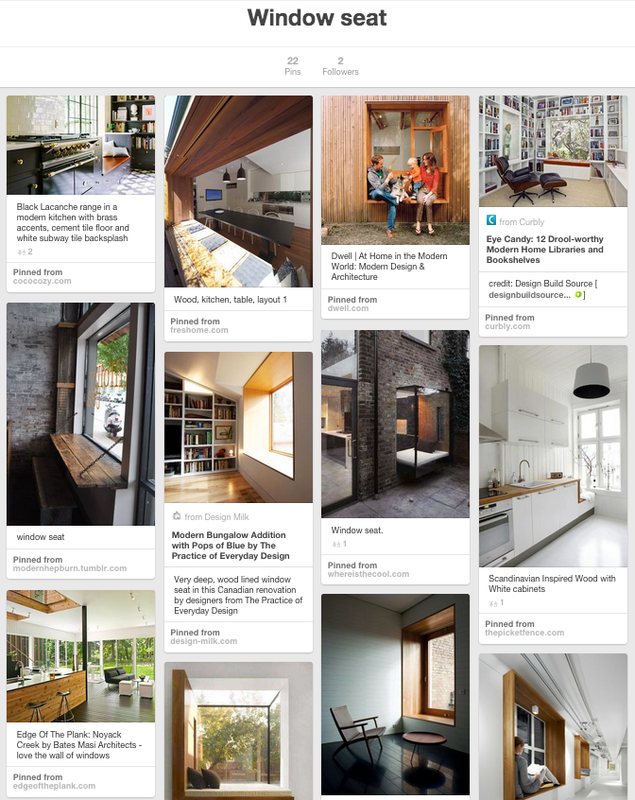 You have seen some of the key spaces, now let’s talk materials and finishes. It’s a real treat as a designer to work with clients who are brave and adventurous, allowing us to include some really nice materials in this renovation. We pulled out all the stops scouring markets and the internet for the right look. 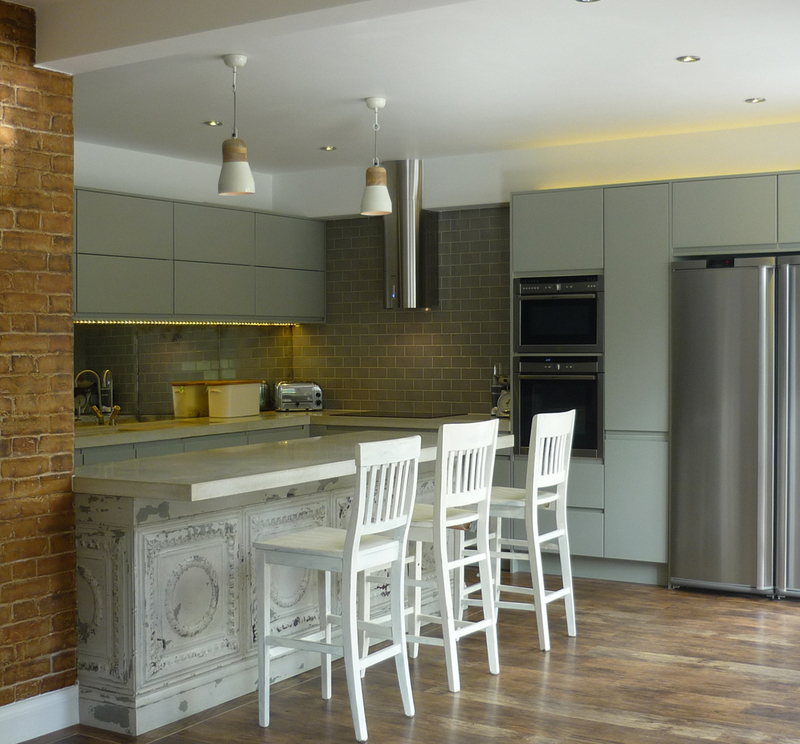 In the end, we married faux London brick on one wall with concrete worktops, crackle glazed metro tiles around the hob with antique mirror splashbacks and stunning hand distressed metal tiles as the panelling on the island. Antique oak flooring marries beautifully with the island pendants in wood and white ceramic, while the subtle coloured pendants over the dining room table twinkle a little glamour. It sounds like a lot of different textures and materials but when they are chosen to compliment each other the result unites in a single look – “boho industrial” we like to call it! The colour palette is muted, and acts as a backdrop to daily life, not an imposition, so the space is comfortable. The large grey blackboard painted wall delivers the thing every household needs – somewhere to scribble notes to family members passing each other like ships and reminders to everyone. 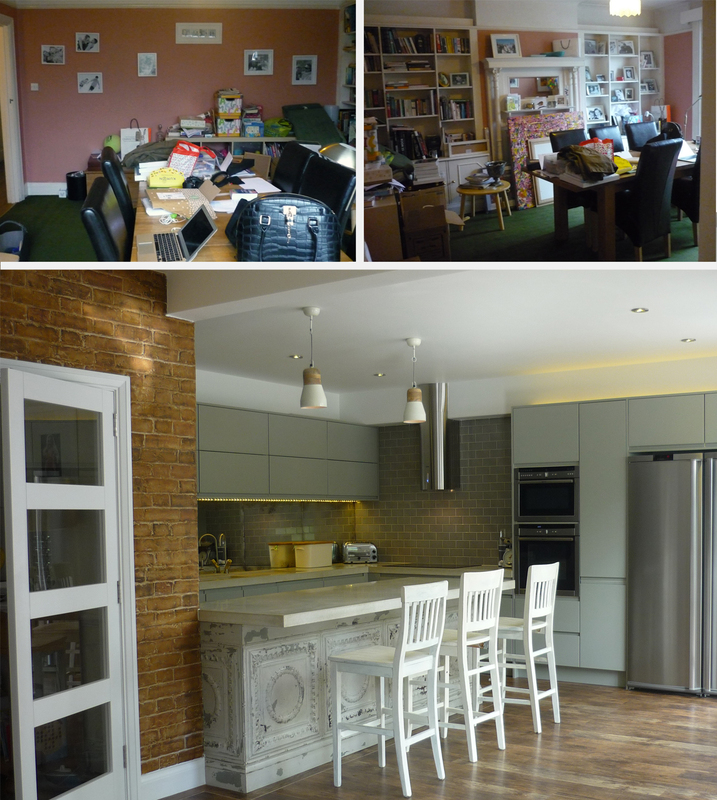 The renovation has truly transformed this home and the experience of being in it, and all without the expense of extending, by really examining the use of the existing space and how to make it so much better! You are thinking of renovating, there’s so much to think about and investigate – how do you get from thoughts and dreams to a new space? You may be considering an extension or whole house renovation and find you are either a. too busy, b. not confident, c. can’t agree with your family or partner how to progress or d. worried about blowing your budget, so you may need my help. If you are too busy then you may need someone to do what you feel you are capable of doing but simply don’t have the time. I can take you from initial thoughts, through design, finding suppliers, right through to moving into your new space. If you are not confident, I can work with you in a variety of ways to help you discover the solutions that are right for you and give you the support to launch confidently into the build and beyond! If you and your partner or family are all full of differing ideas I can listen, analyse your needs and help you become unstuck and move forward with your project. If you are worried about blowing your budget I can sit down with you, listen to your needs and aspirations and help point you in the direction of the solution that will make best use of your hard earned money. I work on projects from concept to completed build, I work with clients on concept and design only and when appropriate and if time allows I work with clients on a workshop basis to get projects started. Working on your home can be all consuming if you are passionate about the results like here at Amo Espaco and it can also be energising and fun. The results will change how you live in your space and the impact on domestic harmony of a successful renovation is always the best feedback clients give. If it sounds like my approach might work for you please contact me on 07743662052 Monday to Friday or get in touch by messaging via the Amo Espaco Facebook page and I will usually revert within 24 hours.